In PoliSci 101 we were presented with a horrifying statistic that over 70% of Americans couldn't name our Vice President. Never one to remain subtle and after all-- being the youngest and nerdiest co-ed in freshman year at sixteen-- I believe my initial response was to laugh out loud, completely convinced that it was our none-too-comically-gifted professor's weak attempt at ironic humor. Taking me up on my disbelief, we were all told to write down the VP and hand the sheets to the front of the room and lo and behold, even 70% of those in college hadn't the foggiest idea who Mr. Al Gore was at the time. I open with this anecdote to interject a privately held pop-culture theory which you're more than welcome to laugh at or disregard which is my inherent belief that if you were to ask those same 70% of people to do so, they'd be more than capable of rattling off the lyrics to a ridiculous number of pop songs. Taking it even further-- similar to the way it's said that Mozart can be absorbed in the womb and the endless psychobabble recorded about nature vs. nurture and just how reliable young memory is-- I'd venture to guess that most Americans born in the 1970s through the early to mid 1980s grew up with the the near frightening ability to recall verbatim all of the lyrics of any given song by Elton John, Billy Joel, and especially the man who was the soundtrack of 1980s suburbia-- Mr. Bruce Springsteen. From "got a wife and kids in Baltimore, Jack/I went out for a ride and I never went back/like a river that don't know where it's flowing/I took a wrong turn and I just kept going," from the Updike Rabbit Run styled "Hungry Heart" to "the highway's jammed with broken heroes on a last chance power drive" in my favorite "Born to Run," or the warning about "glory days well they'll pass you by in the wink of a young girl's eye, glory days"-- the lyrics and music of the man known in my youth simply as The Boss seemed as vital as any major institution or corporation be it Coca Cola to the U.S. Government (at least to my particular generation anyway). Moreover, it seemed like he, Joel, John, and other musicians were the new leaders in rock and the layer of the music and society was blended together very similarly to the way that Dylan's, The Beatles', The Beach Boys', The Rolling Stones', and others were so ingrained in the DNA of the generation that came before mine. Of course, this is despite the fact that all styles and artists were soon devoured by musically hungry fans including this reviewer whose appetite for anything fresh, groundbreaking, or contemplative helped add a second level of appreciation for Springsteen's homage to the acts that came before him. Yet, the reason that in lieu of his millions, he's still our favorite American "blue collar" rocker-- is because he speaks to everyone in a multitude of ways whether it's just in fun tunes you can appreciate with the window rolled down in the summer breeze or on a more academic level piecing together the Woody Guthrie inflections or other inspirations laced throughout. Although, Springsteen and his incomparable E Street Band were never an act that relished in the fleeting activity of hit-making. No, instead by weaving important narrative threads even through the songs that became an anthem of my youth as Springsteen's arguably most famous album Born in the U.S.A. (complete with the cover of his rear in denim which stunned the grade schooler in me), we realized had a whole lot to say in its titular song that kids repeated and sang along to instinctively before realizing what the message of "U.S.A." was in regards to the Vietnam War. And frankly, just as much as reports indicate that books you encounter as a child become a central part of you, I'm also a fervent believer that all of the arts impact you in the exact same way whether it's in the form of music, film, painting, theatre, dance or whatever medium you behold and the children of the '80s definitely benefited from having another extremely important "professor" to help steer us towards humanity and compassion in the otherwise yuppie era of the Reagan and Bush administrations. Moving effortlessly between the topical, hard-hitting story-songs including a few that earned him either Golden Globe and/or Academy Award nominations and statues like the brilliant "Streets of Philadelphia," and 2008's "The Wrestler" for the Mickey Rourke film by director Darren Aronofsky which is included as a bonus track on his newest album, Springsteen bravely took risks throughout his career to speak out on topics that compelled him. From working with humanitarian efforts to becoming the musical voice of our post 9/11 nightmare with his incredibly inspiring songs from 2002's The Rising and daringly taking on the Bush administration with his protest filled former 2007 record Magic-- I wasn't quite sure what to expect with 2009's Working on a Dream which astonishingly marks his twenty-fourth album release. Mixed and recorded primarily at Atlanta's Southern Tracks with additional work completed in New York, Los Angeles, and New Jersey, as Springsteen reveals in the Columbia Records press release, he became increasingly excited at the prospect of returning to pop production sounds during the end of recording Magic. In his fourth collaboration with producer and mixer Brendan O'Brien, Springsteen and the E Street Band tried to channel "the energy of the band fresh off the road from some of the most exciting shows we've ever done," with an album he proudly shares is comprised of songs that were all penned "quickly," utilizing "one of our first few takes." Although the audacious wild, wild west tongue-in-cheek eight minute opener "Outlaw Pete" about a baby who "robbed a bank in his diapers" will immediately recall the same Young, Guthrie, Dylan, and Seeger influences that have colored his work in the past-- Springsteen pulls a fast one on listeners. He does so by abandoning the old-fashioned but symphonically produced story song intro to Working on a Dream and moving right into the jubilant, upbeat, and radio friendly pop sensibilities via his infectious ditty "My Lucky Day" that culls from the country sounds of the folk beginning and segues it with keyboards and a toe-tapping rhythm. In the titular follow-up that gently slows things down to a nice, easier listen sound with a '60s inspired chorus as he sings about "working on a dream" that "love will make.. real someday," he introduces us to the main thread of the album in an effort that sounds overwhelmingly hopeful as opposed to the darkness of some of his previous records, despite that fact that true to Springsteen's more realistic nature, the melancholy and self-inventory of life, love, and the paths we take are woven throughout. Still, in a wonderfully addictive record-- one of my two favorite works in 2009 so far and running a close second to the debut album from Glasvegas-- that's been deservedly compared to the music and technique of Phil Spector and Brian Wilson, Springsteen lightens up a bit and lets us in more than in some other work which kept us at an arm's length in ways that seem to more nakedly reveal his thoughts rather than singing about the thoughts and conditions of others. Love is a motif that runs throughout with both positive and negative connotation in the musically impressive "What Love Can Do," that gives the E Street band a chance to show off as well as in the admittedly silly yet still somehow so-daffy-it-works concoction "Queen of the Supermarket" that finds a man pining for the beautiful check out girl that he can't bring himself to speak to but whose smile "blows this whole f***ing place apart." While a few of the lyrics and the idea of love among the flourescent lights and unflattering uniforms has met with some dismay in certain reviews-- it's a refreshing track and one in which Bruce gets in touch with his inner adolescent girl who pines for the handsomest boy in school who doesn't know she's alive. From the definite Spector meets Wilson medicinally soulful uplift of "This Life" that first sounds like a purposely retro track before his contemporary vocal sets in to the far bluesier, dive-bar by the side of the railroad tracks number "Good Eye"-- Springsteen's testing himself in a variety of styles in a way that makes the album even more fascinating on repeat plays. Moreover, unlike some of the younger acts today such as the excellent but stuck-in-neutral Coldplay, he's unwilling to make an album filled with a dozen tracks that all sound the same. While "Tomorrow Never Knows" sounds a bit like Bob Dylan-lite despite some truly pretty lyrics and the darker "Life Itself" makes a weaker companion for the second half of the record-- he once again sweeps us off our feet with the orchestral infused "Kingdom of Days," the familiar but instantly likable 60's British style "Surprise, Surprise," and the heartfelt, understated, intimate "The Last Carnival" which Rolling Stone notes is an elegy for the sadly deceased E Street band member Danny Federici, who passed away as a reult of cancer in 2008. 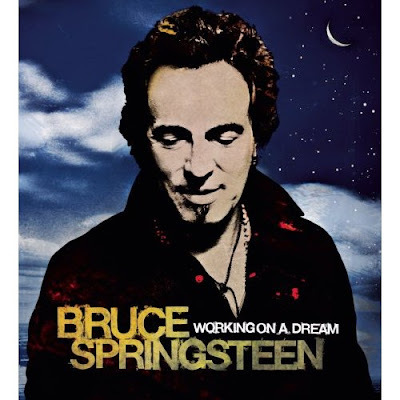 Yet although "Carnival" was initially supposed to close his stellar twenty-fourth album Working on a Dream, Springsteen surprised everyone with one of the record's best songs included as a "bonus" with the Oscar nominated, Golden Globe award-winning song "The Wrestler" which he wrote in honor of his friend Mickey Rourke who'd phoned him and the two chatted about his role in Aronofsky's film that was a highly personal one for its star whose life seemed to echo that of his fictitious character. One of Springsteen's most haunting and deceptively simple, beautiful tracks-- "The Wrestler"-- is an album standout and one that not only should've received the Oscar this year but also reminds us just how amazingly gifted the man I first came to know as The Boss is at inserting himself empathetically into any character or situation. Compassionate, powerful, romantic, funny, sad, and warm-- while CD sales have fallen in the wake of the digital age and I shudder to imagine which musicians are now informing the youth of this generation, I hope that in addition to those like this reviewer who have evolved along with his music over the past few decades, others will seek it out to recall the type of music and lyrics we're missing from the mainstream today. Namely it's the type of songs that somehow make their way into our DNA so that at three in the morning we wake up with a song stuck in our head or feel like we've met any one of the dozens of individuals Bruce Springsteen becomes in his character pieces that remind us that even though a ridiculous number of us can't name our Vice President, we're constantly reminded of our humanity and responsibility to one another. And in the end, part of this is via Springsteen's gifted ability to have us figuratively walk-- at least for the length of a track-- in another person's shoes, or at the very least, share a headphone with them to remind us that we're all more alike than we'd initially assume.